Wedding sparklers at the wedding exit, an old trend though, but is becoming more popular day by day. Wedding sparklers are being used as Grand Wedding Exit for the last five years. They add a real sparkle to your wedding photography and also make your wedding wishes a glittery one. We want to bring some creative and unique ways to use these wedding sparklers instead of the typical use at the end of the wedding night. The use of these amazing bursts can be much more whimsical than the same presentation at the end of your reception. You can light your entire wedding day with the help of these sparklers. Mentioned here are 7 fun-loving ideas, incorporating them will definitely add a glimmer to your great day. Rather than the usual mix up of a flower girl, make her step in the hallway with a single lit wedding sparkle in her hand. This will add a sparkle to her beauty resulting in a priceless picture. In lieu of the same conventional rose petals spread everywhere; make it more classy and trendy by this unique sparkling bride walking down the aisle. It won’t make it difficult to clean the hallway and also it is really economical. You can buy them online easily. Standing ahead of the typical norms is what makes your big day an example to be talked about and remembered even after years to go. Adding sparkle to the common cake-cutting ceremony will help you create a unique and extraordinary one. Whether you’re displaying your cake by wheeling it out or presenting the show on a stationary table, 20” Gold sparklers are the best quality sparklers to create a 2-minute extravaganza. For a quick and charming presentation, the 20” sparklers – versus sparklers with a longer stem are the best option. If you want to put the sparkler directly in the cake, don’t forget to tell this to your baker so that he or she will make decor with this extra flare in mind. Give the sparklers out to your bride team as you plan to lock lips with your beloved. As soon as you come closer and close your eyes, ask your team to come behind you and create a magical moment with the sparklers. Try to frame “I DO KISS” at the back of the couple. Accurate time is necessary for establishing this scenario, so do practice this one day before your big day. This will also add the photogenic view to your album; you will be pleased to see that picture every night. An upgrade is needed to the custom of the unity candle. You will still be using the unity candle but will need wedding sparklers to light them. This will add an extra romantic moment for the newlyweds and will also spics up for the guests. It is a very fantastic way to add some glitter to your wedding ceremony. A sparkling end is always necessary after the reception. 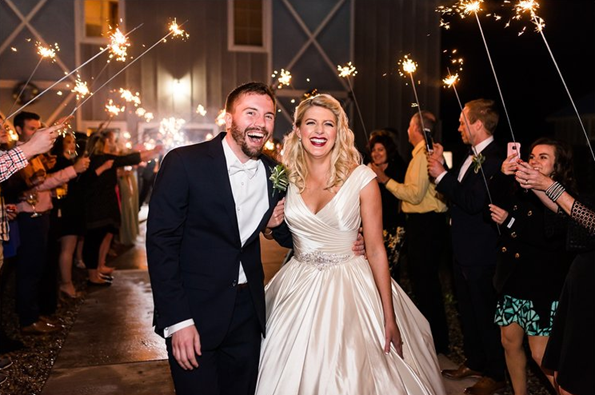 Create a walkway with wedding sparklers; this is a really alluring addition to the ideas of using sparklers. Ask your guests to align on either side of the aisle. 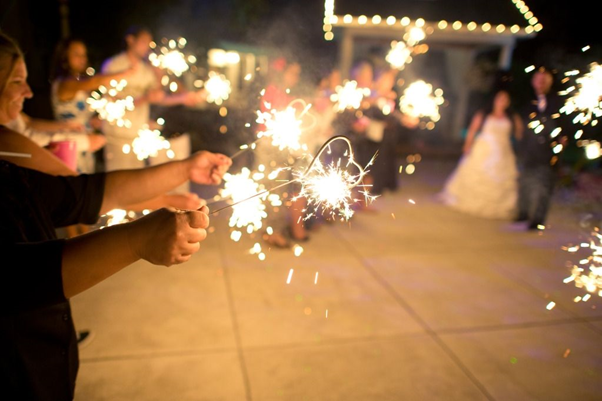 Make the bridesmaids and groomsmen distribute the wedding sparklers among all of them and start lighting them up. You can also ask the guests to pass the lit sparkle to the person next to them; it will make a domino effect. One the sparklers are all set, you are ready to pass through the glittery audience. Accept it or not, the cake cutting ceremony has lost its charm in the weddings. It has become a difficult task to keep the audience attentive towards the cake. But no worries, your catering service can wheel out this ceremony in a tremendous way. 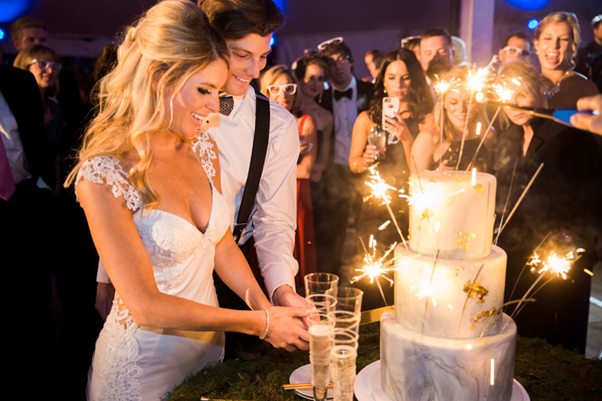 Add the wedding sparklers to your cake and you are successful in grabbing the attention of the audience! One more unique way to increase the glamour of your wedding night is to use the wedding sparklers in your first dance. Arrange your bridal team and guests on the dance floor with 36 inches wedding sparkles. They have a burn time of over 3.5 minutes. This will light up the dance floor for you, and you will get a more lovable moment with your beloved. Make sure it can get longer sparklers to make this ceremony last longer. Umer Ishfaq is a Search Engine and Content Marketing expert at Techvando. A writer by day and reader by night, his passion for helping people in all aspects of online marketing flows through in the expert industry coverage he provides. How is 3D Hologram Projection Technology Changing the Business Landscape?